We are a leading Manufacturer of bomb calorimeter, bomb calorimeter with automatic calculation, digital bomb calorimeter with inbuilt printer, digital bomb calorimterer with puff insulation, digital bomb calorimeter - auto gas filing unit and digital bomb calorimterer from Mumbai, India. Athena Bomb colorimeters are widely used for determining gross calorific values of liquid and solid samples.AUTOMATICALLY. User doesn't need to make any manual calculations, all calculations are done automatically displayed, printed and transferred to PC.All the processes is done by highly intelligent microprocess or program. We use special imported calibrators for proper calibration of the system.The controllers are specially designed & manufactured to achieve best possible measuring accuracy desired by the user. Athena Technology provides a simple and inexpensive method for determination of heat of combustion of organic matter and the calorific valve & sulphur content of solid &liquid fuel. The outfit supplied is complete for analysis as per method recommended by British Standard Institute BS1016. All part of outfit have finished and tested according to the specification laid down by institute of petroleum and British standard institute.Each Bomb is tested before it leaves the factory. In accordance with the requirement of the institute of petroleum (I.P. 12/63 T. Appendix 1) and a works certificate is issued with each Bomb. This certificate gives the result of hydraulic testing under pressure of 300 atmospheres (4400psi) maintain for a period of ten minutes without any sign of leakage. The maximum deformation must not exceed the specified limits.The vessel is made up of copper and is chromium plated or SS. It includes a Bomb support that ensures proper positioning of Bomb in the vessel.The outer container of Jacket is made up of Stainless Steel.The top is closed by the back-light cover called combined lid. A terminal block is fitted to the top of the container so that Connection can be made from the Electronic firing unit and provisions for water pouring and water outlet are also given at the top and bottom respectively. Temperature scanning resolution of 0.01 °C. No paper or printer door open detection. User interaction messages on LCD. Internal Data Logger with computer Interface. PC Software for Data Record. Athena Technology provides a simple and inexpensive method for determination of heat of combustion of organic matter and the calorific valve & sulphur content of solid & liquid fuel. The outfit supplied is complete for analysis as per method recommended by British Standard Institute BS 1016. All part of outfit have finished and tested according to the specification laid down by institute of petroleum and British standard institute. Each Bomb is tested before it leaves the factory. In accordance with the requirement of the institute of petroleum (I.P. 12/63 T. Appendix 1) and a works certificate is issued with each Bomb. This certificate gives the result of hydraulic testing under pressure of 300 atmospheres (4400 psi) maintain for a period of ten minutes without any sign of leakage. The maximum deformation must not exceed the specified limits. The vessel is made up of copper and is chromium plated or SS. It includes a Bomb support that ensures proper positioning of Bomb in the vessel. The outer container of Jacket is made up of Stainless Steel. The top is closed by the backellite cover called combined lid. A terminal block is fitted to the top of the container so that Connection can be made from the Electronic firing unit and provisions for water pouring and water outlet are also given at the top and bottom respectively. The stirring mechanism supplied gives sufficient turbulence for effective stirring whilst no heat is imparted to the calorimeter water. It consists of an impeller stirrer driven at a constant speed of approximatly 800 rpm. The offset arrangement whereby the motor drives the impeller via a belt precludes any possiblility of heat transference between motor and calorimeter Vessel Contents. unit incorporates a digital Beckmann thermometer for the precise measurement of the rise in temp and electronic circuitry that provides the electrical means for firing the samples, Sockets for stirrer, sensor and terminals for electric leads are also provided at the backside of the unit. Various types of crucible are availabe but the standard supplied with the outfit being a stainless steel crucible of 8 ml capacity which fits in the standard support ring provided with the outfit. 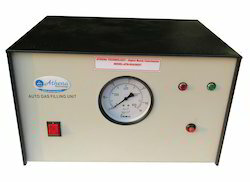 Athena Bomb colorimeters are widely used for determining gross calorific values of liquid and solid samples.AUTOMATICALLY. User doesn't need to make any manua lcalculations, all calculations are done automatically displayed, printed and transferred to PC.All the processes is done by highly intelligent microprocess or program. We use special imported calibrators for proper calibration of the system.The controllers are specially designed & manufactured to achieve best possible measuring accuracy desired by the user. Automatic measurement and calculation of CALORIFIC VALUE/WATER EQUIVALENT . No paper or printer door open detection.User interaction messages on LCD. Internal Data Logger with computer Interface.PC Software for Data Record. 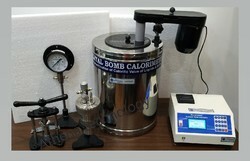 Digital Bomb Calorimterer with Puff Insulation colorimeters are widely used for determining gross calorific values of liquid and solid samples. Automatically User doesn't need to make any manual calculations, all calculations are done automatically displayed, printed and transferred to PC. All the processes is done by highly intelligent microprocessor program. We use special imported calibrators for proper calibration of the system. The controllers are specially designed & manufactured to achieve best possible measuring accuracy desired by the user. 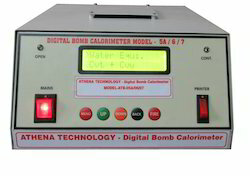 Digital Bomb Calorimeter with automatic calculation, Printer, Computer Interface and Auto Gas Filling Unit Model ATB –07 with following features. Auto Gas filling Unit fills oxygen in bomb with constant rate every time and thus increases the repeatability of results. Athena Technology provides a simple and inexpensive method for determination of heat of combustion of organic matter and the calorific valve & sulphur content of solid & liquid fuel. The outfit supplied is complete for analysis as per method recommended by British Standard Institute BS 1016. All part of outfit have finished and tested according to the specification laid down by institute of petroleum and British standard institute. Each Bomb is tested before it leaves the factory. In accordance with the requirement of the institute of petroleum (I.P. 12/63 T. Appendix 1) and a works certificate is issued with each Bomb. This certificate gives the result of hydraulic testing under pressure of 300 atmospheres (4400 psi) maintain for a period of ten minutes without any sign of leakage. The maximum deformation must not exceed the specified limits. The vessel is made up of copper and is chromium plated or SS. It includes a Bomb support that ensures proper positioning of Bomb in the vessel. The outer container of Jacket is made up of Stainless Steel. The top is closed by the back-light cover called combined lid. A terminal block is fitted to the top of the container so that Connection can be made from the Electronic firing unit and provisions for water pouring and water outlet are also given at the top and bottom respectively. Digital Bomb Calorimeter with automatic calculation, Printer, Computer Interface and Auto Gas Filling Unit The stirring mechanism supplied gives sufficient turbulence for effective stirring whilst no heat is imparted to the calorimeter water. It consists of an impeller stirrer driven at a constant speed of approximately 800 rpm. The offset arrangement whereby the motor drives the impeller via a belt precludes any possibility of heat transference between motor and calorimeter Vessel Contents. The unit incorporates a digital Beckmann thermometer for the precise measurement of the rise in temp and electronic circuitry that provides the electrical means for firing the samples, This unit also has printer that prints the temp. reading after every 30 secs. (approx.) As the rise in temp reading are being recorder by the printer continuously so the operator is totally free to do any other job thus saving operators time and the human errors involved with recording the readings are also eliminated. Sockets for stirrer and terminals for fuse wire are also provided at the backside of the unit. 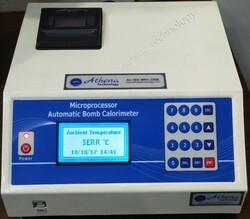 Digital Bomb Calorimeter with automatic calculation, Printer, Computer Interface and Auto Gas Filling Unit Model ATB -07 with following features. The Unit Incorporates A Digital Beckmann Thermometer For The Precise Measurement Of The Rise In Temp And Electronic Circuitry That Provides The Electrical Means For Firing The Samples, This Unit Also Has Printer That Prints The Temp. Reading After Every 30 Secs. (approx.) As The Rise In Temp Reading Are Being Recorder By The Printer Continuously So The Operator Is Totally Free To Do Any Other Job Thus Saving Operators Time And The Human Errors Involved With Recording The Readings Are Also Eliminated. Sockets For Stirrer And Terminals For Fuse Wire Are Also Provided At The Backside Of The Unit. Looking for Digital Bomb Calorimterer ?